Sternfield was one of the first churches that I visited for the Suffolk churches site, and I had been looking forward to going back. Ten years on, not much had changed. 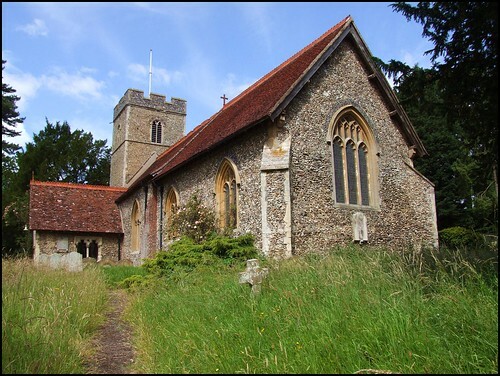 The village of Sternfield is surprisingly rural for somewhere so close to Saxmundham and the A12, and it has one of the most gorgeous churchyards in the county, enclosed by holly hedges and pine trees. I remembered the rabbits which had fled into the ditch as I approached the church on that day in 1998, although it had only been early afternoon. Since then, the rabbit population in Suffolk has taken a serious dip, but over the last couple of years it has returned to its previous abundance; the creatures are irrepressible. On this July morning, the sun was just beginning to burn off the dew, and I wondered if I was too early for the church to be open, but I needn't have worried. This is a pretty, quirky building, its parts noticable for their slightly unusual proportions as it sprawls on its slight rise. The long porch is most attractive, almost as if it were a transept to the little nave. The window shafts in the sides are gorgeous, with capitals and tracery. Unfortunately, they are infilled with perspex sheeting. The slight, unbuttressed tower lends the porch even more grandeur, and on the north side of the porch is a curiosity, a 14th century piscina. It remains from a chapel that once stood here. I shuffled a swathe through the long wet grass around the east end, disturbing a ginger cat who looked at me as if I must be wholly stupid if I didn't realise that he owned the place. I came round to the south side, and stepped into that beautiful porch. I knew that St Mary Magdalene would be open, partly because they nearly all are around here, but also because I had been told so, several times. Back at the end of the old century, I had received an apologetic reponse to my first visit, when I was unfortunate enough to encounter my first suspicious keyholder in Suffolk. A new churchwarden had been aghast that her predecessor was not so friendly as she was. In fact, this is so long ago now that it is hardly worth mentioning, but I do so as a reminder to pilgrims and travellers that other churches which are currently difficult of access may also one day find themselves under kinder, friendlier regimes. So, don't give up. I had forgotten quite how dark this church is inside. If Sternfield graveyard has a delightfully rustic feel to it, it has to be said that the inside of its church doesn't, really. This is rather an urban restoration. The interior is the work of that 19th century maverick J.P. St Aubyn, and although much has survived it, his stamp is everywhere. The church had, in any case, been extensively restored in the 1760s, generally an unhappy date for restorations, so we may assume that St Aubyn did much to improve things. He extended the chancel, and rebuilt the chancel arch. He raised and glazed the sanctuary. However, a medieval sanctus window survives in the west wall, as do a couple of stained glass medieval heraldic shields. Eastwards, there appear at first to be two entrances to the rood loft, one each side. Mortlock thought the one on the south more likely to be a banner stave locker; if it is, then it is in a unique location. To the north of the communion rail an unusual pair of little windows survive, which may have been a squint from the north chapel altar, or may even have been moved here from elsewhere. They are quite in keeping with the monastic mood of the porch. They are reminders of the past life of this building, and touchstones down the long Sternfield generations, who include Edward Hunt, who, according to a charity board, in 1625 left a gift for those who do not receive parish relief, in coals, meat, and sometimes, gifts in money. Another former parishioner, Susanna Long, died almost two centuries later, at the age of 102, blessed by the Almighty with the full possession of her faculties until the day of her death. Her nephew was the Rector, William Long, one of the last of the old guard of Georgian preachers before the wave of sacramentalism sent out by the Oxford Movement reached Suffolk and transformed this little church into the way it is today.